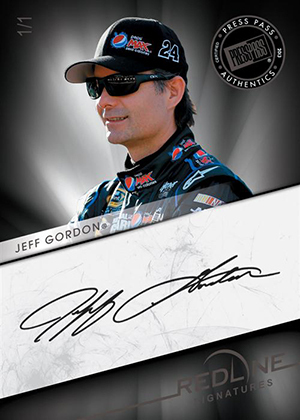 The key component of 2013 Press Pass Redline Racing is the promise of an autograph and a memorabilia card in every pack. The premium-focused set has a small box configuration with just two packs. But they're two packs that carry some pop. Autographs come in six different sets. Leading the way are Redline Signatures. Besides regular versions, there are also short print variations that have a different driver photo. 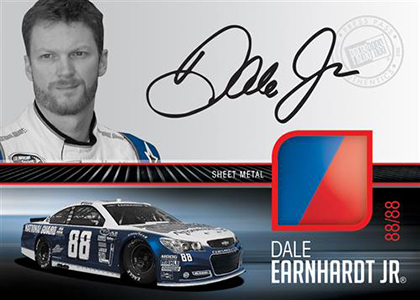 Focusing on the legends of the racetrack, Remarkable Relics come with an autograph and three relic pieces. Dark Horse highlights up-and-coming NASCAR stars. 2013 Press Pass Redline Racing has nine different insert sets that have race-used memorabilia. At least one of the two memorabilia cards in every box has two or more pieces. Career Wins Dual Relics not only have a pair of memorabilia pieces, but they're die-cut to the shape of career wins the driver has. 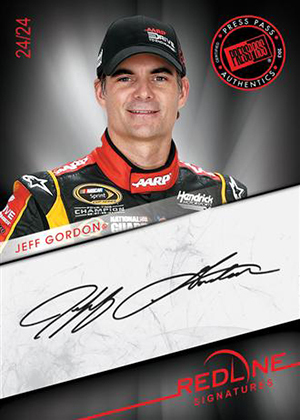 2013 Press Pass Redline Racing packs come with ten cards. Shortly before the set released, Press Pass announced a fifth hit in every box. This is noted with a sticker on the box. Check out the 2013 Press Pass Redline Racing checklist here.